U.S. Distribution Rights: Right Stuf, Inc. Description: The crew of the Soyokaze is back to face a new challenge. It seems Raalgon hasn't given up the war effort they lost in the TV series, and with the invention of a new weapon of mass destruction, there is a distinct possibility of a return to combat. This is a very good, rewarding, dramatic story, highly recommended. Viewers should probably expose themselves to the TV series first to get some grounding in the characters. The art is outstanding, and the character designs are the same as in the TV series. The music (by Kenji Kawai, who did the score for the TV series also) is first-rate. 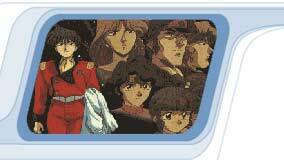 The story takes place after the events in the Irresponsible Captain Tylor TV series. The Rarlgon empire has developed a new secret weapon which may provoke a new war. The story is not what might be expected: it is slow paced, cerebral, thought-provoking, with little action and less comedy. The feelings of Tylor and the empress Azaling for each other, the feelings of Dom for Azaling(! ), and especially the feelings of Tylor's crew for Tylor, are highlighted. The story leads us to ask ourselves questions about unconditional love and unconditional trust. OVA and movie continuations of TV series tend to be rather disappointing, frequently rushed and seemingly ill-thought out. Exceptional Episode seems to be the exception (no pun intended). Its actually resolves several issues left unanswered at the end of the TV series, and isn't afraid to get darker in order to realistically do that. However, unlike some other continuations, it emerges from the darkness at the end, staying true to the spirit of Tylor. There are moments when watching it you begin to wonder where the comedy went, and yes, some of the characters (Dom in particular) seem to have drifted from their TV personalities, but there are valid story reasons for these changes. Brining about the end of a war means many sacrifices, and the cast learns this lesson well, particularly Azalyn (Note: My parents win, I was forced to watch Roman Holiday thanks to this). Excellent drama, and though not the laugh riot the TV series is, comedy has not been forgotten. Plus some more insight into what is truly important to Tylor (rather surprising!) This series is required viewing for anyone who enjoyed the TV series.